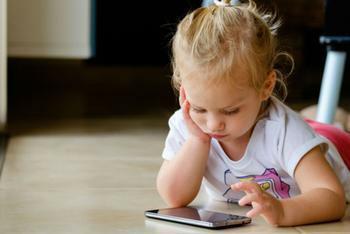 The American Academy of Pediatrics (AAP) has revised its previous guidelines for screen time for children and adolescents. Its new, less stringent set of guidelines reflect changing media habits as well as new research. Previously, the group’s official recommendation was that parents and caretakers refrain from allowing children under 2 to spend any time in front of screens. For older kids, the AAP recommended limiting screen time to just two hours a day. New guidelines, released Friday, focus on the role of parents and the importance of balancing media use with other healthy habits. The AAP now says children under 18 months can see screens, but only in the form of video chatting. Other recommendations state that an adult should be present to provide guidance when children are engaged in screen time. From tablets and TVs to smartphones and apps, screens have become almost inescapable in the time since the AAP’s previous guidelines were released. Rather than shielding children from screens altogether, the group now recommends that parents get more involved in their kids’ screen time. "Families should proactively think about their children's media use and talk with children about it, because too much media use can mean that children don't have enough time during the day to play, study, talk, or sleep," says Dr. Jenny Radesky, a developmental behavioral expert and pediatrician at the University of Michigan C.S. Mott Children's Hospital in Ann Arbor, MI, and lead author of the first policy statement, "Media and Young Minds." "What's most important is that parents be their child's 'media mentor.' That means teaching them how to use it as a tool to create, connect and learn," she adds. For babies younger than 18 months. The AAP still says screens should be avoided when kids are this young, but FaceTiming with Grandma or video chatting with another familiar face is a-okay. There is research to suggest that children as young as six months old can gain certain cognitive insights from video chatting. Children 18 to 24 months old. When kids are 18 months old, parents can introduce high-quality digital media. The AAP says it’s important, however, that children not watch programming alone. Adults should be present to help kids understand what they’re seeing. Children ages 2 to 5 years. Screen time should be limited to one hour per day of high-quality programs, such as Sesame Workshop or educational media on PBS. Again, parents should be present to talk with kids about how to apply what they’re seeing to the world around them. The AAP's guidelines for older kids, ages 6 to 18, don't include any strict limitations on screen time. Instead, the academy says parents should set consistent limits on the amount of daily screen time older kids are allowed. Parents should also make sure screen time doesn't take the place of healthy activities such as sleep, social interaction, and physical activity. To help promote a healthy balance, AAP recommends designating "media-free times together, such as dinner or driving, as well as media-free locations at home, such as bedrooms." Need help coming up with a media use plan that works for your family? Check out the AAP's interactive tool for creating a customized Family Media Plan.